Squadron Leader John Follett Bristow was born in Belfast on 8th May 1907 of Church of Ireland faith. Bristow joined Northern Bank on 11th May 1925 in Head Office. Transfers followed to Antrim Road 1925, Head Office 1927, Connswater 1931, Head Office 1933 and Lisburn 1940. In 1928 he joined the RAF Special Reserve.On 2nd December 1940, he joined the RAF Volunteer Reserve RAFVR. His Service Number was 89053. Promotion came in July 1941 to Pilot Officer, Flying Officer in December 1941 and Flight Lieutenant in December 1942. The London Gazette records him as being a War Substantive Squadron Leader from December 1943. He relinquished his commission in July 1963 with a rank of Flight Lieutenant, RAF Secretarial Branch. Following demobilisation, Bristow resumed duty in the Bank on 15th November 1945 in Head Office. Transfers followed to Markets 1945, Donegall Square 1948 and Head Office 1966 as Sub Chief Accountant. He retired on 31st May 1970.
via Northern Bank – War Memorials / Roll of Honour : Bristow, John Follett. Thanks to Ione Evans in New Zealand for finding this. John Follett Bristow was the son of Samuel Follett Bristow, and Alice Maud Green, who were married in the Cape Colony in about 1905. They had two other children, Follett Berkeley Bristow and Harry Walsham Follett Bristow. Alice Maud Green was the daughter of Henry Green and Ida Carolina Johanna von Lilienstein. She married Arthur James McLeod, a lawyer of Bulawayo, who died in Barkly West in the Cape Colony in 1904, and then she married Samuel Follett Bristow, who came from Northern Ireland. They seem to have returned to Ireland for a couple of years, because their middle son, John Follett Bristow, was born there, but the youngest, Harry Walsham Follett Bristow, was born in Krugersdorp in the Transvaal, in 1908. 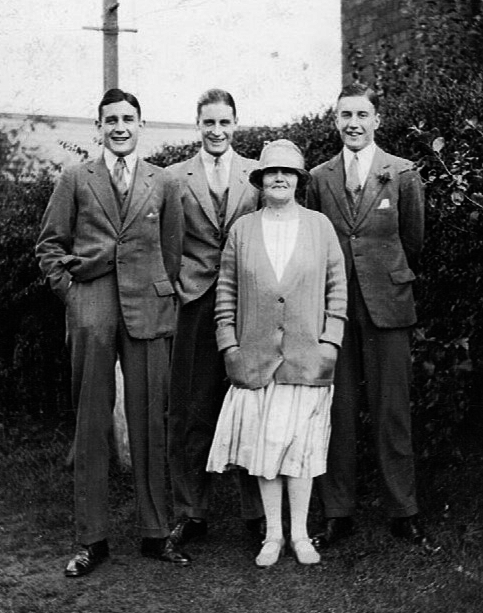 Alice Maud and the three Bristow boys – 16 Sep 1927. Thanks to Jane Kenny & Ione Evans for the picture. It is interesting that her house name was “Esdaile”, a name that crops up again and again in the Green family history, either as a name given to children or to houses. Thomas Esdaile was the stepfather of William John (Goodall) Green, the grandfather of Alice Maud Green, described by William John Green in his will as “the kindest man I have ever met” — and therefore honoured by succeeding generations. In view of her surname, I also wonder if her third husband was related to the founder of Campbell College.